private Early Years and elementary school LAAS Lonati Brescia. Lonati Anglo-American School welcomes you to our growing family. 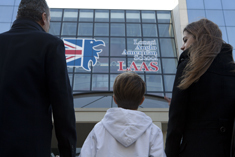 LAAS is a colorful and lively school where students, parents, teachers and staff come together with a focus on and dedication to excellence in education. An array of nationalities and cultures is represented at LAAS, offering an international atmosphere that promotes knowledge, personal growth and the greater good within our school community and the wider world. At the center of it all is your child whose personal well-being and academic development depend upon you and your selection of a solid school programme of high standing and excellent reputation. At LAAS, our work is dedicated to providing the essential knowledge, skills and values your student will carry forward for a lifetime – priceless tools with which he or she will build a lasting future. At LAAS we work together to set in place a foundation of collaboration that links school, home and community. After all, the happiness, success and personal fulfillment of your child depend upon those whose support and guidance offer caring commitment. From our international programme of study to our hand-picked selection of qualified staff, we strategically plan for tomorrow and for the years to come. LAAS emphasizes a positive learning environment, where everyone is respected and valued, where persons are encouraged, challenged and inspired by a drive to know, to give their part, and to share in the joy that is all around them. In so doing, we annually reach out to the friendliness, wisdom and experience of others by corresponding and collaborating with schools in our own community, including these learning institutions financed by the Fondazione Adele e Cav. Francesco Lonati, including Istituto Tecnico Superiore Machina Lonati, MachinaImpresa and Centro Formazione Professionale Lonati. Additionally, LAAS works in steady partnership with Cooperativa Foppa, a private learning institution that supports these local post-secondary schools within Brescia: Liceo Artistico Foppa, Accademia di Belle Arti SantaGiulia and Centro Linguistico Culturale San Clemente. Everywhere you look at LAAS, there is learning going on.